So you sell Cigars, Lighters, CBD (Cannabidiol) related products, and you’re having trouble finding an advertising channel that doesn’t explicitly disallow it. Turns out that Google Adwords, Google Shopping, Bing Ads, Bing Shopping, and even Yahoo don’t allow for Ads for tobacco or marijuana products. What’s interesting is that while these Search companies disallow it in their terms of service, they often do allow certain categories. 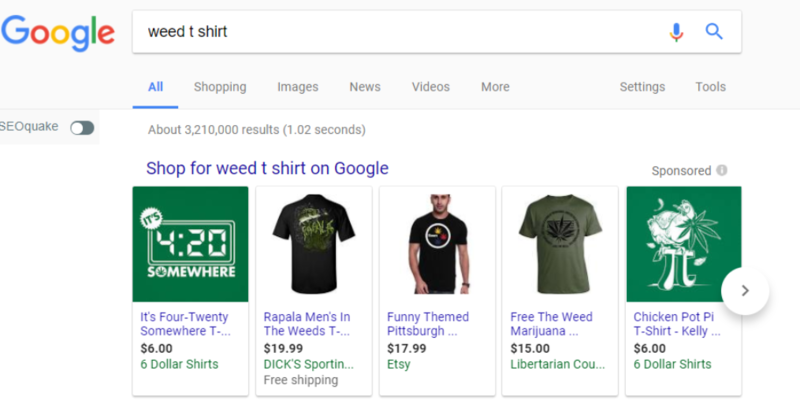 You’ll also see ads for “Weed T Shirt” on Google Shopping. But if you try other searches like CBD chocolates, you won’t find anything. Google and Bing disallow ads for cigars, but turns out there are channels that allow it. So the question is What channels allow you to advertise tobacco/marijuana related products? Turns out Connexity, which owns Shopzilla.com, Bizrate.com, and Pricegrabber.com allows for tobacco related products. If you search for cigars, you’ll find them on Shopzilla.com.